My Zelda shirt collection is probably the largest portion of the clothing collection. Some of them are official and some of them come from some really snazzy artists that sell their amazing work on online t-shirt sites or at the several conventions I go to. Other Info: According to http://www.geek.com/geek-cetera/love-meter-t-shirt-lights-up-when-another-is-near-1280673/"The Love Meter T-Shirt shows a battery on the front with heart lights which increase as you get closer to another person wearing the same t-shirt. It’s great couples! When individuals are away from each other the shirt only shows two and a half hearts. When they come within five meters the hearts show full." One is a Men's XXL and the other is a Women's L. You can see in the pictures the shirts are shown together fully lit and then individually 1/2 lit. Shirt is machine washable after being disassembled. Each shirt requires 3 AAA batteries not included. Other Info: Purchased while attending the Zelda Symphony at the Chicago Theater in 2012. 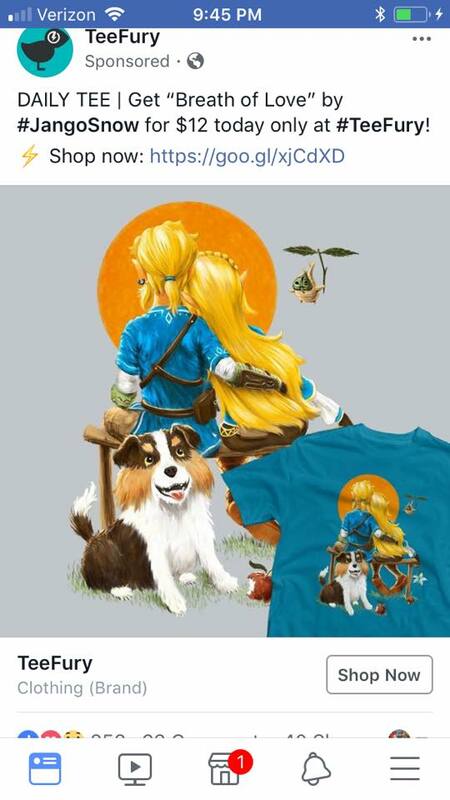 Other Info: From Hot Topic, Fitted tee with oversized sublimation print of Link on Epona. Other Info: From Hot Topic, T-shirt with front sublimation print inspired by The Legend Of Zelda: Ocarina Of Time. Other Info: From Hot Topic, Fitted black tee with The Legend of Zelda: The Wind Waker inspired stained glass window design.